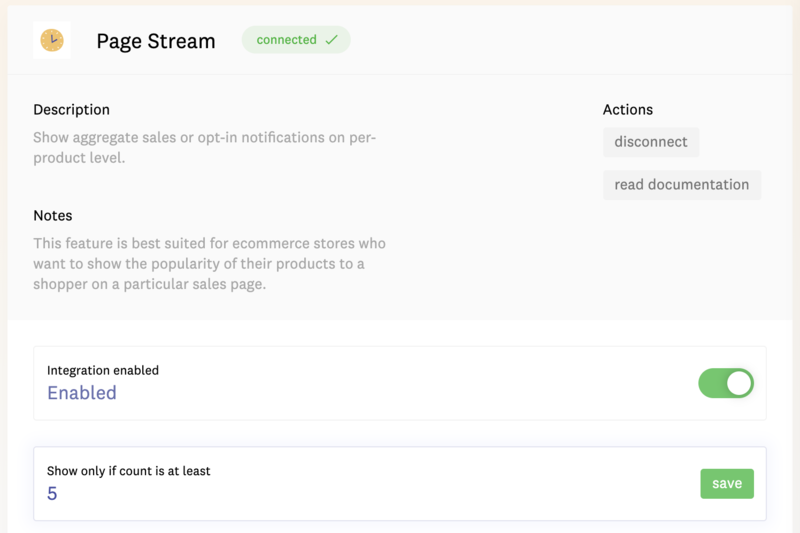 Page Stream is one of our most requested features since launch in 2016. For ecommerce stores especially, it helps express the popularity of every one of your products on a per page level basis. Suppose you sell red shoes and blue shoes. On your red shoes sales page, e.g. /product/red-shoes , Fomo will show notifications like "5 sneakerheads bought these in the last 24 hours." Then, on your blue shoes sales page (/product/blue-shoes ) Fomo will similarly show a count of blue shoes purchases. Each notification roundup is counted for that product/page only, and is not shown on other URLs. While logged into Fomo navigate to Integrations, then search for Page Stream or scroll down to find it. For all notifications with clickable URLs, Fomo will now aggregate similar notifications/events (with the same URLs) and show them off on that page of your website. You can modify the template messaging of your Page Stream notifications anytime by clicking the template itself inside Fomo > Integrations > Page Stream. Sometimes your website has a "slow period" with fewer sales or opt-ins in a given time period. If a give product's sales or signups aren't at least that amount in the last 24 hours, we won't turn it into a notification.